The older I get, the more I prefer a savory, hearty breakfast. I will always love good cinnamon rolls, waffles and pancakes. But when I want to feel energized and start my day off right I’ve come to go for more savory options. 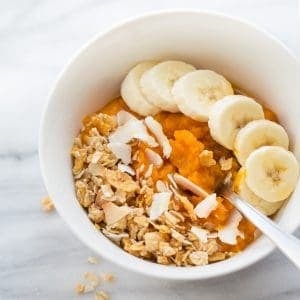 These breakfast bowls and flavor-packed, hearty and so satisfying! 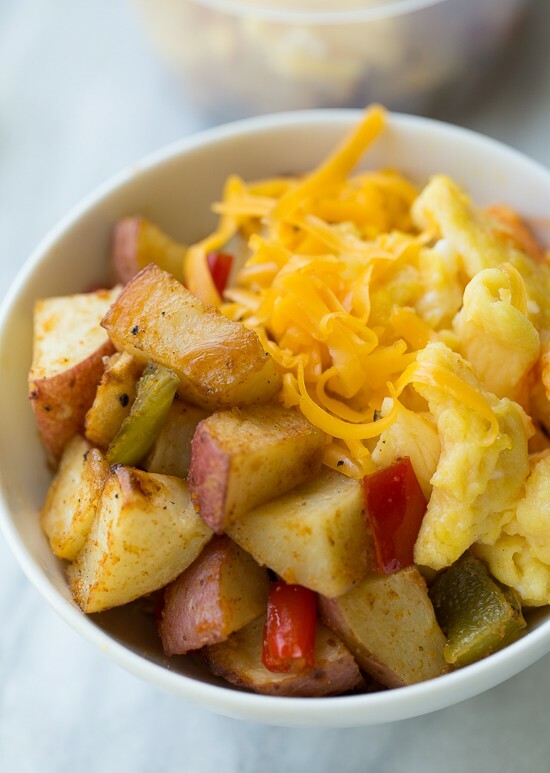 These bowls have roasted breakfast potatoes that are seasoned up and cooked with bells peppers and onions, along with scramble eggs and a sprinkle of sharp cheddar cheese. Yum! Sometimes savory breakfasts take the longest to make – so the make-ahead option for these bowls is a lifesaver. I notice when I eat a big breakfast like this, I don’t crave sugar or treats at nighttime. Some of my other favorite make-ahead breakfasts are these Creamy Almond Butter Chia Puddings (full of healthy fats and superfoods!) 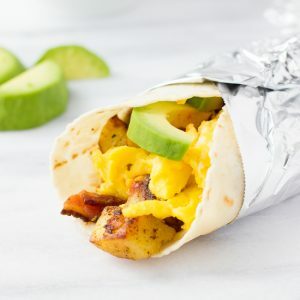 and these Gluten-Free Breakfast Burritos (my husband’s absolute favorite!). Have you been trying to do meal-prep? It is something I’m getting more into myself. I love the idea of cooking once and having meals ready in the fridge for the week. Add these to your meal prep line-up! 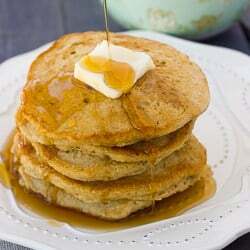 They are easy to make and unbelievably delicious! 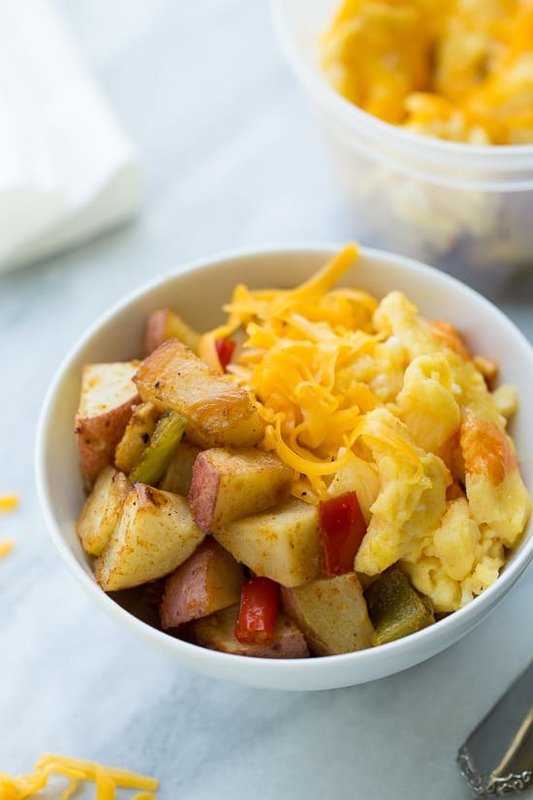 These Southwest Potato Bowls from Vegetarian Mama also look delicious! Preheat the oven to 425F. Place the potatoes, onion, green pepper, and red pepper on a large baking sheet. Pout over the oil then sprinkle over the seasonings. Mix well to evenly combine and spread into an even layer. Allow the potatoes to cool slightly while you make the scrambled eggs. Beat the eggs together until smooth and pour into a pan set over medium-low heat. Add the butter and cook until the butter is melted and the eggs are just set. (Don’t overcook the eggs here if you’re planning on reheating them later.) Season to taste with salt and pepper. Divide the potatoes and eggs between 6 individual containers. Top with cheese if desired. When ready to eat, reheat the eggs/potatoes in the microwave on 50% power for 1-1 1/2 minutes. Top with hot sauce and serve. 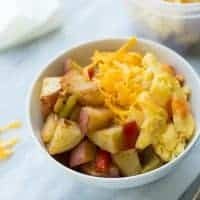 Egg/potato bowls will keep for up to 4 days. Enjoy! MAKE IT DAIRY-FREE: Omit the butter and skip the cheese. Love, love, love! Keep the “make ahead” dishes coming! So many great flavors here! Making these ahead of time is such a great idea. Where did you purchase the freezer bowls? I got them on Amazon! They are great for storing all kinds of things in the freezer. Love all these flavors going on! Breakfast served. How long can they stay in the freezer for?? These look amazing but I always struggle with recipes like this because we don’t own a microwave! Do you have a suggestion on how you would heat them otherwise? Would it work in the oven? I am struggling with gluten free breakfasts! If you don’t have a microwave, I would try reheating this in a pan on the stovetop with a little bit of oil or cooking spray if you are taking it out of the fridge. If you have them frozen, then I would try the oven (or a toaster oven if you have it), and maybe finish on the stovetop to try to help the potatoes re-crisp a little. I bet the stovetop would work great to re-crisp the potatoes like you said!